Patients wait to be treated at Mgabathi Hospital in Nairobi (file photo). 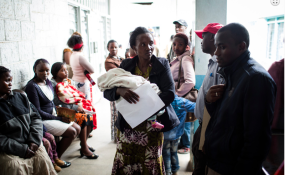 Nairobi — Every year, one million Kenyans are driven below the poverty line by healthcare-related expenditures. Poverty predisposes them to disease and slows all aspects of growth in the economy. Poor health hobbles economic growth. Noble Laureate in Economics Robert Fogel noted in 1993 that better diets, clothing, housing and quality healthcare all play an important role in generating economic growth. Strengthening healthcare systems to increase access to affordable, appropriate and quality health services in any country is a prerequisite for long-term development and structural transformation. Africa accounts for a quarter of the world's disease burden but has less than 5 per cent of the world's doctors. The continent lags far behind in basic healthcare coverage for services such as immunization, water and sanitation, and family planning. Kenya is no exception. The new Kenyan Constitution devolved responsibility for primary and secondary healthcare services to the newly demarcated 47 counties, leaving the national government to focus on policy and research. Kenya's health financing envelope is progressing gradually but falls short of the 2001 Abuja Declaration, in which nations committed to allocating 15 per cent of their national budget to the health sector. In fact, Kenya is outperformed by some of its neighbours in the national budget allocation to health sector. In fiscal year 2014/15, Uganda allocated 8 per cent of its national budget to the health sector compared to Kenya's 4 per cent. Kenya's allocation has been increasing every fiscal year, rising for instance from about US$178.8 million (Ksh 15.2 billion) in 2001/02 to US$382.2 million (Ksh 34.4 billion) in 2008/09 based on exchange rate then. In the current fiscal year, Kenya allocated around US$597 million (Ksh 60.9 billion) for healthcare services compared to US$591.2 million (Ksh 60.3 billion) for fiscal year 2016/17. This is projected to increase in the medium term to US$606.9 million (Ksh 61.9 billion) and US$614.7 million (Ksh 62.7 billion) for 2018/19 and 2019/20, respectively. The challenges confronting the health sector range from the spread of non-communicable diseases to inadequate funding of health interventions. The devolution of healthcare services, coupled with the Bill of Rights, elicits huge funding demands, making the sustainability of gains made so far in the sector more complex. In 2015, the international community formally enshrined UHC in Agenda 2030, the Sustainable Development Goals, which will guide development efforts through 2030. In its Vision 2030, Kenya committed to becoming a competitive and prosperous nation with a high quality of life for all its citizens by 2030. Investing in a quality health delivery system is enshrined in the Vision, an area in which the government has made considerable progress. Revamping the national health insurance scheme to comprise everyone capable of paying premiums, rather than only those in formal employment has shifted the burden of healthcare costs from the individual to the collective by raising more money for healthcare services. Nevertheless, four out of every five Kenyans have no access to medical insurance. That is why Kenya needs to adopt more innovative ways of financing its healthcare system. The 2014 World Bank Group's Kenya Public Expenditure Review considers the private sector a lead in local healthcare markets. This is because it owns 60 per cent of all primary healthcare facilities, while 40 per cent are government-run. Leveraging this strategic position of the private sector, public-private partnerships (PPP) can be institutionalized for financing UHC in Kenya. One such case in point is the strong PPP established in 2015 by six private sector companies (Philips, Merck Sharp & Dohme-MSD, GlaxoSmithKline-GSK, Safaricom, Kenya Health Care Federation and Huawei) to improve maternal health in historically marginalized counties. This initiative - targeting Mandera, Marsabit, Migori, Isiolo, Lamu and Wajir and spearheaded by the Government of Kenya and the UN - has yielded positive health outcomes. Similar approaches can be adopted for the health system at both national and county levels. Kenya is known for developing innovative home-grown solutions to challenges. It can easily move towards a cashless economy, which will be critical for driving Kenya's socio-economic transformation agenda. For instance, M-pesa was conceived to address the challenge of rural banking but it has also provided a platform for M-health, the use of mobile devices to support the practice of medicine and public health. Kenya can institute targeted taxation as an innovative financing policy to complement existing financing mechanisms. Partnering with mobile phone service providers and charging a small fee for targeted healthcare initiatives can generate the necessary resources to support UHC in the country. An estimated US$122.5 million (Ksh 12.5 billion) is transacted daily in the form of mobile money transactions. By contributing roughly one percent on a graduated scale, Kenya can easily raise US$ 1.2 million (Ksh 125 million) daily to finance UHC. For example UNITAID, an International Drug Purchase Facility for AIDS, tuberculosis, and malaria is supported mainly (70%) through the airline ticket tax. The airline solidarity contribution is an innovative attempt to gain the benefits of a global tax. Kenya can do the same by charging a small tax at its international airports and border crossings for a ring fenced public health account. There is no one-size-fits-all health financing solution. And Kenya must continuously adapt in the face of rapid technological changes. Dr Tedros Adhanom Ghebreyesus, the new WHO Director-General has said that, "all roads should lead to universal health coverage." With its technological prowess, a hotspot for innovation, incredible entrepreneurial spirit and enterprise, Kenya must be at the vanguard on the road to universal health care in Africa.